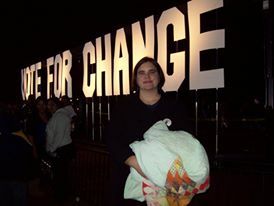 At Obama's final rally before the election in 2008. For the people reading this in the year 2050 (assuming America still exists), "Thanks, Obama" was a sarcastic meme that people used to blame Obama for everything wrong in the world. But I'd like to reclaim it and offer a sincere Thank You to the man who led us for 8 years. I'd be the first to recognize that Obama failed on a lot of fronts. He did not succeed in uniting us, and left us in many senses divided. He was not able to get a lot of his policy ideas through Congress, due partly to Republican obstructionism but also I think partly to a lack of relationships and ability to work with others. He also presided over the loss of over 7,000 state/local level Democratic seats over the past 8 years, which means the Democratic Party has some rebuilding to do. Syria is one of the worst vacuums of foreign policy in recent years and is a humanitarian disaster of epic proportions. Obama may have excelled at the poetry and vision of campaigning, but he was not always great at the prose of governing. Despite this, I honor his accomplishments and dignity. He never descended to personal insults with those who disagreed with him. He did work hard to make this country better, and was able to accomplish much. The Affordable Care Act expanded access healthcare to millions and likely saved lives. He worked with other countries to address the global challenges of climate change. The Obama administration was also able to reach a historic deal with Iran to dismantle their nuclear weapons program. We repealed "Don't Ask, Don't Tell," allowing all to serve with honor in our military, regardless of sexual orientation. He appointed two able Supreme Court justices, both women. He worked to keep our country safe from terrorist attacks. Ultimately he spoke eloquently of the need for racial justice and gun control, despite not being able to accomplish much in the way of legislation to address these issues. 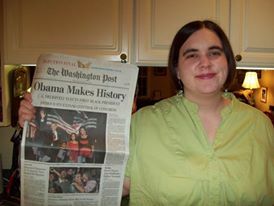 It's easy to forget how historic Obama's win in 2008 was! 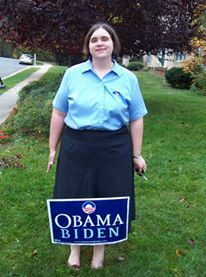 Obama was far from perfect, but I think he was a good and decent man and a faithful public servant. So, for all this, Thanks Obama. Even though I know you were constitutionally prohibited from staying, I will miss you.